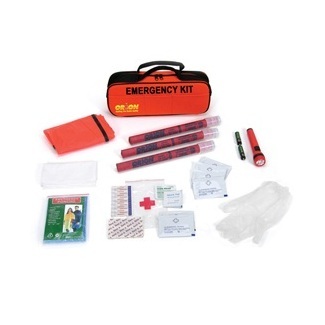 3 20 minutes flares, 1 folding triangle, 1 waterproof flashlight w/batt. 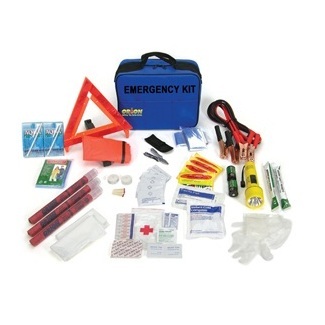 2 6" green light sticks, 1 jumper cable 10-GA/8'', 1 multi tool, 1 reflective vest, 1 rain poncho, 2 shop cloth, 4 hand warmers, 2 thermal blankets, 2 water pouches, 2 candles & 10 matches. 3 20 minutes flares, 1 folding triangle, 1 waterproof flashlight w/ batt. 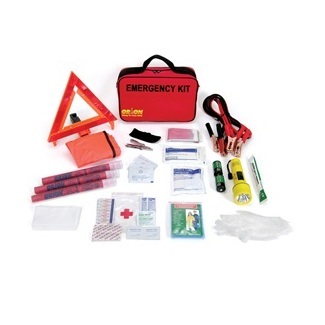 2 6" green lightsticks, 1 jumper cable 10-GA/8", 1 multi tool, 1 reflective vest, 1 rain poncho, 1 shop cloth, 1 thermal blanket. 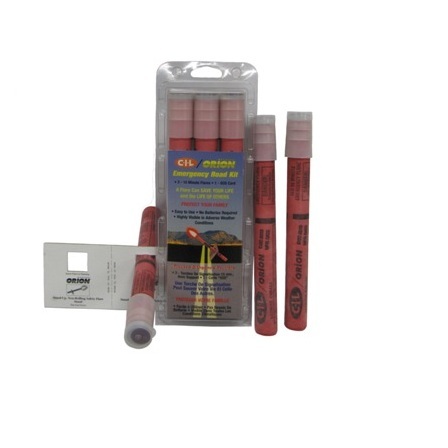 3 20 minutes flares, 1 waterproof flashing light w/batt. 2 6" green lightsticks, 1 reflective vest, 1 rain poncho, 1 shop cloths, 4 towelettes, 13 bandages, 2 alcohol wipes, 2 antiseptic towelettes, 1 string wipe, 1 pair of latex gloves. 3 Highway flares 15 minutes red with stand.